Superior in grade and best in quality, this immaculate prayer wheel is assembled with its core pieces made from solid brass (machined by technology) and its surface adorned by tedious handcrafting from great artisans. Departing from the usual traditional pieces, the heavy and solid core pieces that are machined to high precision enables an extremely smooth spinning of the wheel around its axis. A spectacular revelation from the usual pieces, this stunning and eye-catching masterpiece features the mantra Om Mani Padme Hum skillfully crafted on the outside of the wheel. 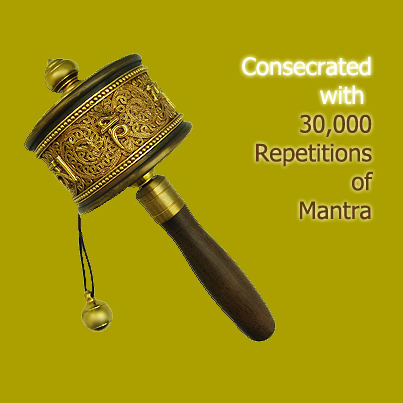 Empowering the sensual piece is over 30,000 consecrated Om Mani Padme Hum mantras contained inside the wheel. The mantras contained inside the wheel is guaranteed. A prayer wheel follows you a lifetime, therefore be wise. Always get the best and never opt for poor quality ones. Buddhists believe that the prayer wheel radiates peace, kindness, and relief from suffering for all beings. According to Buddhist teachings, spinning a prayer wheel has many benefits for you, your family and even the world, too many to mention here. Briefly, the blessings of the prayer wheel helps bring happiness to you, your home, and to all beings. It helps transform your home into a very peaceful, pleasant and holy place. And it helps to heal sickness and protect from diseases. According to the Tibetan Buddhist tradition based on the lineage texts regarding prayer wheels, spinning such a wheel will have much the same meritorious effect as orally reciting the prayers. The prayer wheel spinning actually facilitates those illiterate to chant the mantra and the effect is the same as reading the mantra. The prayer wheel is used to accumulate wisdom and merit (good karma) and to purify negativities (bad karma), thus resulting in less sufferings and a smoother life. Simply touching a prayer wheel is said to bring great purification to negative karmas and obscurations. This translates to good luck in the layman's interpretation. The concept of the prayer wheel is a physical manifestation of the phrase "turning the wheel of Dharma," which describes the way in which the Buddha taught. the prayer wheel originated from ‘The School of Shakyamuni sutra, volume 3 – pagoda and temple’. The practitioner most often spins the wheel clockwise, as the direction in which the mantras are written is that of the movement of the sun across the sky. On rare occasions, advanced Tantric practitioners such as Senge Dongma, the Lion-Faced Dakini, spin prayer wheels counterclockwise to manifest a more wrathful protective energy. As the practitioner turns the wheel, it is best to focus the mind and repeat the Om Mani Padme Hum mantra. However, it is said that even turning it while distracted has benefits and merits, and it is stated in the lineage text that even insects that cross a prayer wheel's shadow will get some benefit. Each revolution is as meritorious as reading the inscription aloud as many times as it is written on the scroll. The benefits attributed to the practice of turning the wheel are vast. Not only does it help wisdom, compassion and bodhichitta arise in the practitioner, it also enhances siddhis (spiritual powers such as clairvoyance, precognition, reading others thoughts, etc.). The practitioner can repeat the mantra as many times as possible during the turning of the wheel, stabilizing a calm, meditative mind. At the end of a practice session, there is a Tibetan Buddhist tradition of dedicating any accumulated merits that one may have gathered during practice to the benefit of all sentient beings. Then chant Om Ah Hum three times.